Here’s what Matt wrote on arrival: “São Paulo is an extremely pedestrian (and bike) unfriendly place, with crushingly bad traffic at all hours as a result. The joke running around the conference this morning was, ‘What time’s your flight? 9 pm?! Then, you’d better leave for the airport now!’ It’s so bad, even my dinky second tier business hotel has a helipad on the roof (and I could see a half dozen on other nearby rooftops). It’s clearly a motor vehicle culture. On my 40 minute rush hour walk, I passed 4 or 5 giant auto tire and rim shops, a deluxe two story Ducati dealership, several motor bike accessory stores, miles of tail lights, and exactly two moving bicycles… both commuters in work apparel with helmets riding on the sidewalk for safety. Hope you weren’t planning a long ride. 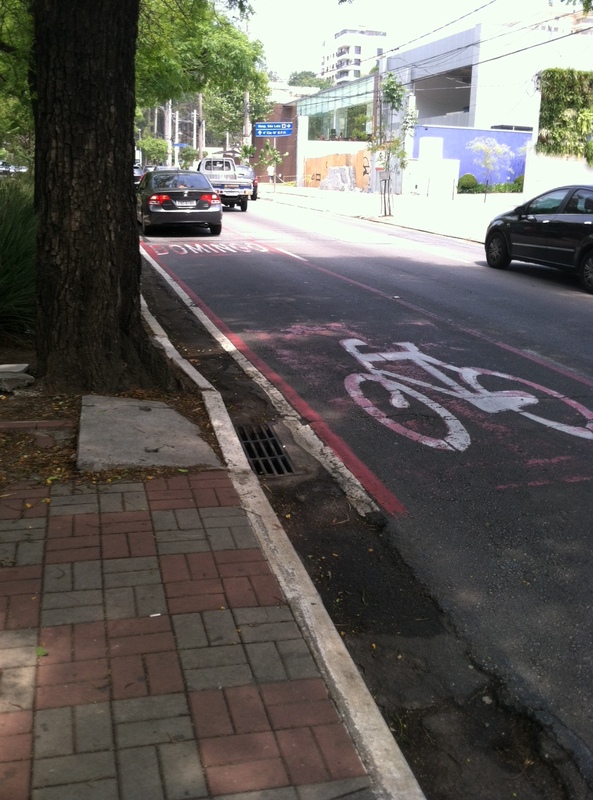 I have not seen a single bike lane yet, though I’m told one exists on Ave Paulista, the main financial street. Here’s a bike lane he found later. Ha ha ha ha! Yeah, it’s not funny. I’m laughing just to keep from crying here. 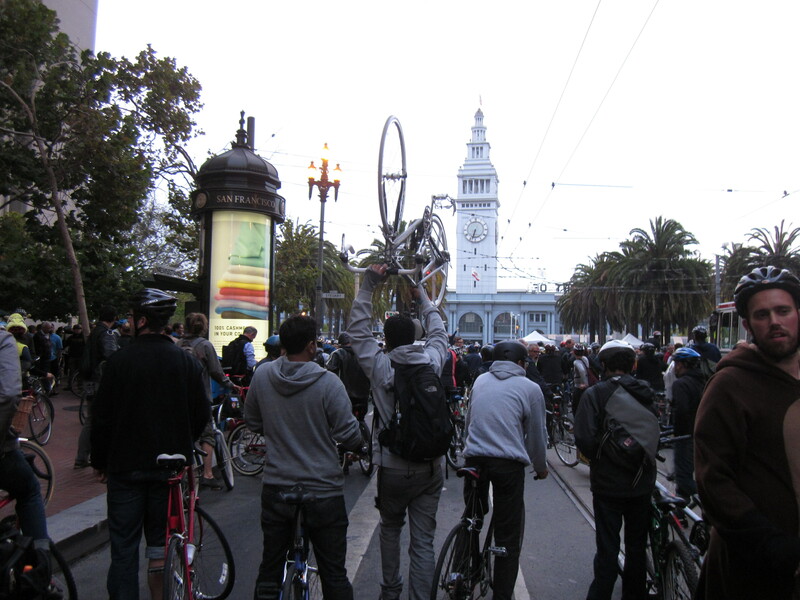 I have commented that I don’t feel particularly threatened by San Francisco car traffic. I wouldn’t feel so sanguine about riding a bike everywhere. 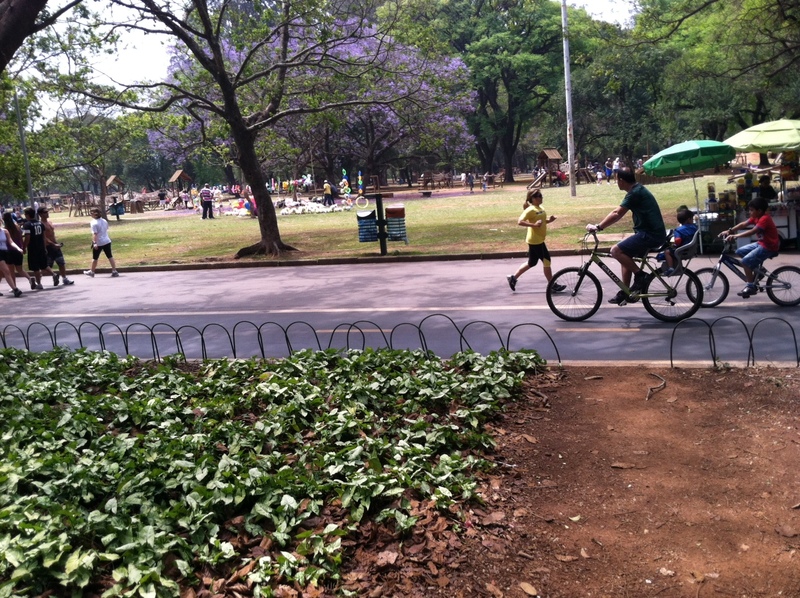 After seeing Matt’s photos I can’t imagine riding a bike for transportation in São Paulo. These bike share bikes would be perfect for commuting, but they never leave the city park. However there are bicycles there. But like many parts of the United States, they’re apparently viewed exclusively as toys. 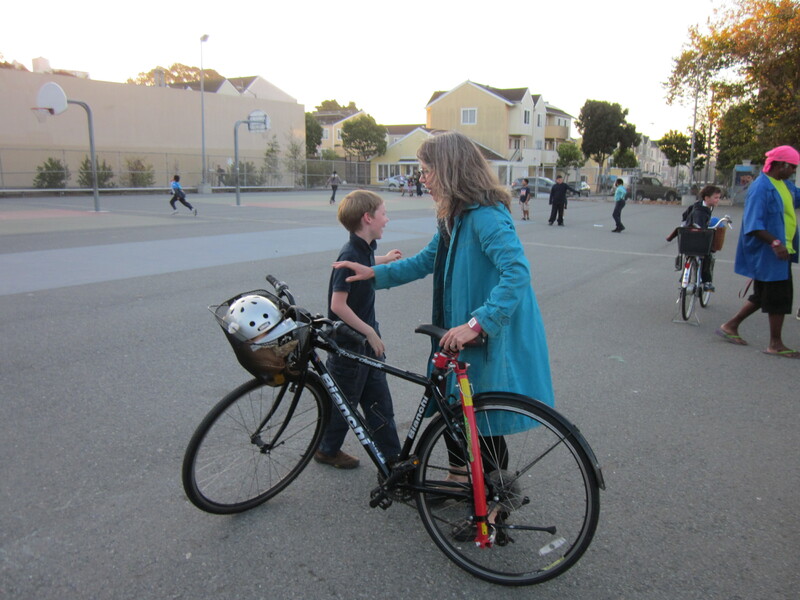 People drive to the park, where they can rent bicycles. 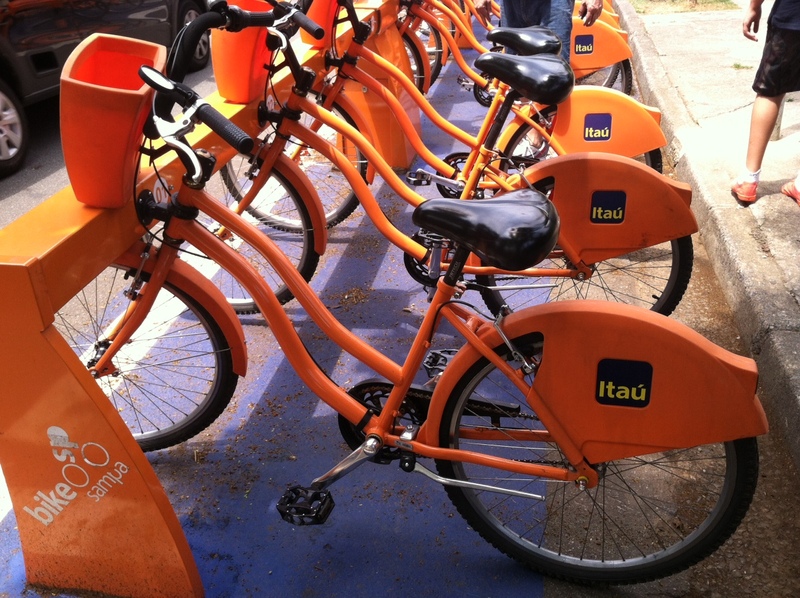 That’s because São Paulo, unlike U.S. cities, has had a bike share program since 2009. I’m torn between envy and despair–it’s a city with bike share, but there isn’t the slightest practical application for it. Now that’s my kind of bike. Here’s Matt, after finally finding someplace in a city of 11 million people where he actually wanted to spend some time. 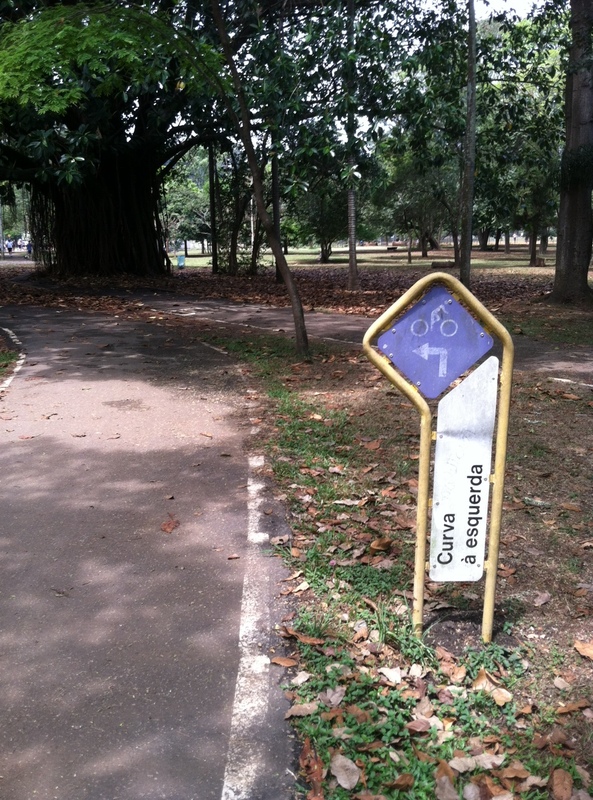 “I spent today in Ibirapuera, the Golden Gate Park of São Paulo. It was a gorgeous, sunny day and people were out in droves, jogging, biking, skating, etc.” If you build it, they will come. Beggars can’t be choosers seems to be the philosophy here. Just like Golden Gate Park, there’s also this weird phenomenon where the city has built separated bike lanes where they’re least needed and that don’t go anywhere interesting. 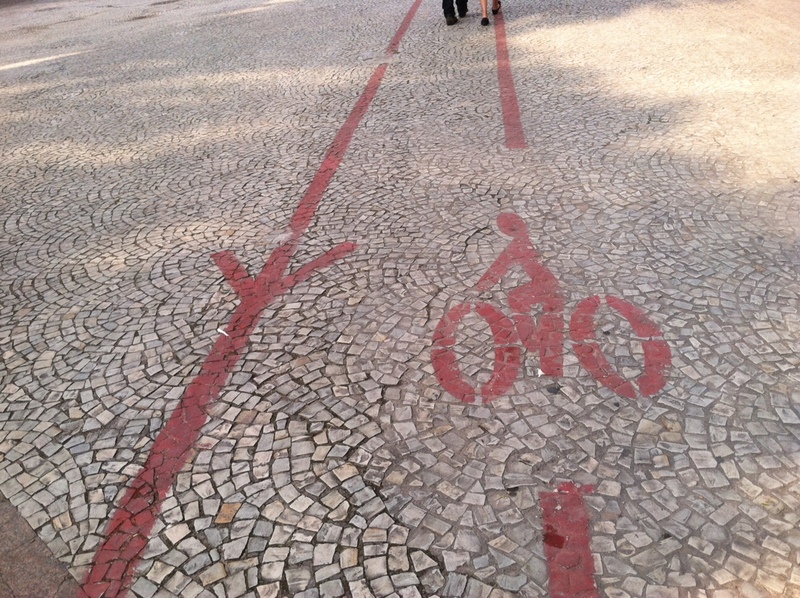 “In addition to separated bike lanes on the main walking paths, there was one area that seemed to be a bike only circuit path — not long enough for a ride but one father was teaching his young son to ride on it.” Like the parents of São Paulo, I like taking my kids to practice on trails like these, but how depressing it must be for the children there to learn to ride a bike only to discover they can’t go anywhere. A view from Matt’s hotel’s helipad tells the story: this is a city that hasn’t thought much about transportation. Seriously thinking about transportation in a major city makes it apparent that a car-centric model is unsustainable. 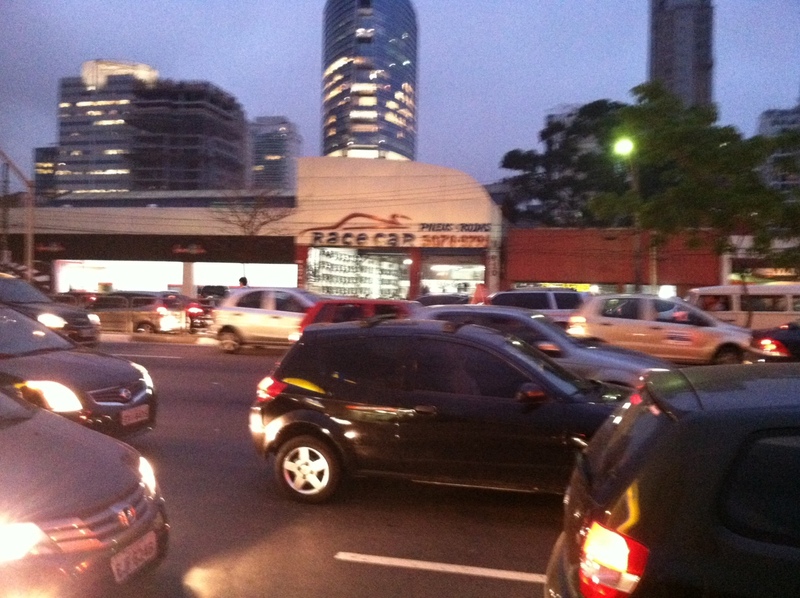 You can see that in São Paulo in the flight to helicopter commuting. But this is hardly more sustainable. Transportation planners tend to take trips to cities with a reputation for doing things right, like Amsterdam or Paris (which has removed tens of thousands of parking places in the last few years to make room for bike lanes). 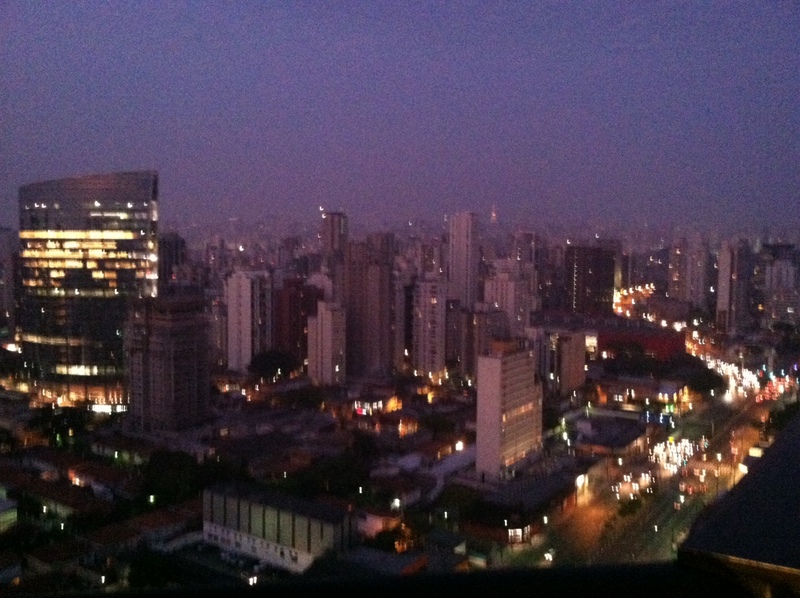 I’m sure that this is more appealing than visiting cities like São Paulo, where no one can go anywhere. But I suspect there would be a lot to learn nonetheless. Riding our bikes to school started us down this road. Transportation interests me because it is a necessary thing, like eating or sleeping. Except in the most extreme cases (like among the comatose), we all have to move around the world. For years I accepted that this experience would be tolerable at best. We would get in the car and drive, dealing with traffic and parking and road rage, because that was just the price of living. Sure, it could be nice to be out of the weather sometimes, but we still had to deal with that same weather once we got out of the car. And we paid several hundred dollars each month for this experience because we thought we had to. I’m late to this party, but happy to be here now. It is no overstatement to say that discovering that there was another way to move through the world changed our lives. I get on the bike and the trip is… fun! When I walk into work I’m not tired. I love our bikes. I can’t imagine going back. I think the same. I enjoy riding my Mama Bike with my daughters. Well, I may be a bit specific. I just saw your post about the globe in the cafe! I had to laugh. Matt is back now, but it was a very interesting trip.